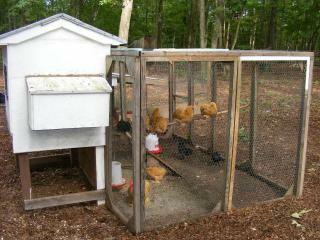 We built our coops long before we ever heard about BYC. Sorry we don't have any pics to show phase by phase of the process. 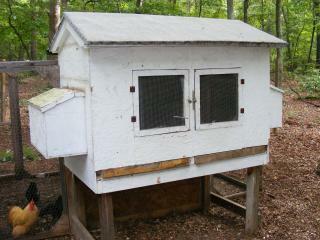 We started with 1 small coop attached to the side of our building. It was 36" x 30" x 30". My son Logan was 6 and my brother-in-law talked us into going to a chicken show. Logan finally talked me into getting a pair of Bantam BB Reds for $10.00. That was in 2005. There was an old deck close to our house so we dismantled it for the lumber and built the house. I'll never do that again, it was so heavy we had to leave it when we moved. 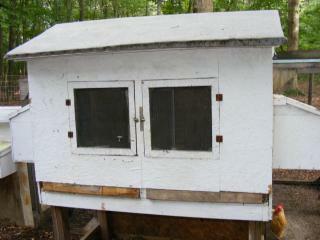 Our coop now was built from 2x2 lumber. 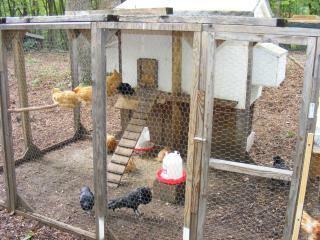 I designed it with a divider in the middle so we could keep seperate sets of birds. There are 2 seperate drawers for the bedding to be changed easily. We use cedar bedding to keep the mites and things away. 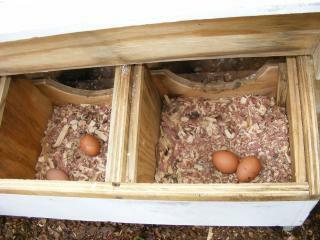 Each side has it's own double nest box with access door outside. We built on 4x4 post off the ground because Sumatras like to roost very high. 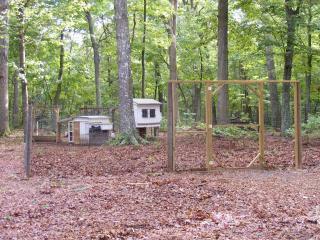 Each side has it's own poplar roost pole. The run is 5' high x 12' long x 6' wide. I made panels and attached the chicken wire with a staple gun. I screwed the panels together that way it would be easy to disassemble if needed. We only keep them in at night or when we are gone. 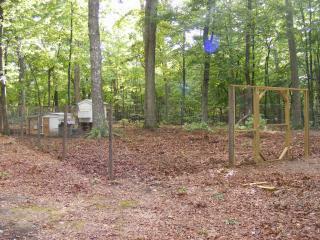 Both of our coops are inclosed in a 60' x 40' fence. We let them free range daily witin the fenced area. Our birds are very tame ( not normal for Sumatras ) because we handle them daily. 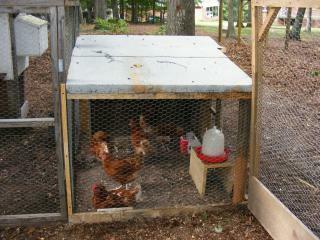 The smaller coop has a 4 nest box setup which we us for our Red Sexlinks. They give us great large brown eggs. "Lovely large run, coop could be improved"
Your run is fantastic! I love the amount of space you provide them! 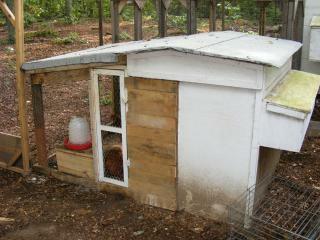 However, you should have more cross ventilation in your coop. 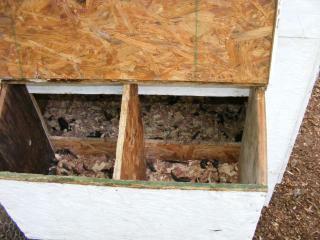 Ideally, there should be at least 1 sqft of ventilation per bird. 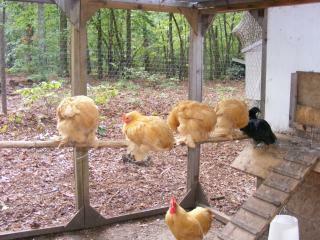 Your coop should also have at least 4 square feet per bird. I don't know how many birds you are keeping on each side, but that is something to be considered. "Love the HUGE fenced run!" This is fantastic, i love it!! Well made!